The doctor will conduct specific exams and tests, including taking a detailed medical history and performing a thorough physical exam. If a mass is suspected, imaging tests such as CT, MRI scans or endoscopy will help to identify the suspicious area and may indicate whether the disease has spread. The imaging tests alone cannot tell if the mass is GIST. The surest way to know is by obtaining and studying cells taken from the mass through a biopsy. Biopsies are sometimes done at the time of surgery (surgical biopsy), but in many cases biopsies are done prior to surgery; sometimes, biopsies can be done during an endoscopy (endoscopic biopsy). In some cases, a needle (fine needle aspiration (FNA) biopsy) is inserted through the skin and into the suspected tumor. Biopsies must be done carefully so as not to break apart the tumor, which might cause bleeding or possibly increase the risk of cancer spreading. When a tumor is found and a sample is obtained through biopsy, a histologic examination will be performed by a pathologist. This is the process of looking at the suspected tumor sample under a microscope to determine malignancy. Once a pathologist has the tissue, he/she will look at various things including the appearance of the cells. They will also apply special stains to the tissue. These stains tell the pathologists whether or not particular proteins are present on the cell, helping to confirm the diagnosis of GIST. Further specialized testing, such as mutational testing, can help identify the subtype of GIST. A pathology report will be issued to your doctor. We strongly advise you to obtain and keep a copy of the report. The information in the report can help in estimating the likelihood of a recurrence of the GIST after surgery. Your pathology report is key to understanding GIST. Here is a simple guide on how to read it: The key to understanding your pathology report. The section below covers further details about the diagnosis of GIST. Identifying the type of cell from which a cancer has developed is a specialized art. The doctors who make these judgments are pathologists, and their job is absolutely critical. The oncologist depends on the pathologist to help determine the type of cancer, so that he/she can plan the best course of treatment. The pathology and diagnosis of GIST are now well understood. Given the importance of the task of the pathologist, newly diagnosed GIST patients may wish to consider obtaining a second opinion of their pathology reports (unless the pathology was initially done by a pathologist who was very experienced with GIST). While many pathologists may be able to accurately diagnose GIST now, predicting the behavior of GIST can be difficult. Experience is important here. A team of doctors and pathologists who are all experienced with GIST will often be better able to develop and implement a specific treatment plan based on each patient’s unique situation. 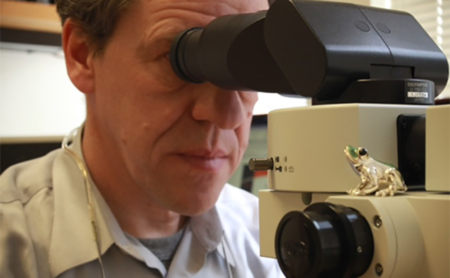 Tissue samples from the biopsy procedure are prepared, from which thin layers of tissue sections are cut and mounted on slides for staining and examination under the microscope. One method that the pathologist utilizes to classify tissues is called immunohistochemistry (IHC). Using this technique, the pathologist applies various antibodies to the tissues. Each antibody binds to specific features (proteins) on the cell surface. The most important antibody that is applied when GIST is suspected is the KIT antibody. When these antibodies bind to their specific target on the cell surface they produce a “stain” or change in color of the tissue sample. So when the KIT antibody is applied, if the cell surface has the KIT protein present on the surface, the sample will “stain positive”. This is what is known as “KIT positive” which means that this cell has KIT receptors on its surface. With rare exceptions, GIST tumors will stain positive for KIT. This means that the cell is manufacturing or using the KIT protein. In the case of KIT, this protein is a receptor. KIT positive-about 95% of the time (the term c-Kit or CD117 may be used instead of KIT). SMA (smooth muscle actin) postive-30% to 40% of the time. PKC theta (PKCθ) is expressed in almost all GIST, but that test may not be available. Increasingly, SDHB (succinate dehydrogenase subunit B) immunostaining is used to further characterize wildtype GIST (does not have a mutation in the KIT or PDGFRA genes), also referred to as Pediatric-like GIST. A negative stain determines loss or absence of SDH protein in the tumor (SDH deficient). In approximately 4% of cases KIT is negative by IHC. These KIT-negative cases likely have cells that do not look the same as most GIST cells and contain PDGFRA (platelet-derived growth factor receptor alpha) mutations (Antonescu, 2008). Note: There is an important distinction between IHC KIT-negative GIST and KIT-mutation-negative GIST. IHC is a test that stains for the protein whereas a mutation test looks for a mutation in a specific gene (KIT, PDGFRA, BRAF, etc). Even when there is no mutation in the KIT gene, a GIST will almost always express the KIT protein. Molecular genetic testing is analysis of the DNA from the tumor sample. In GIST, it is also a clinically useful technique that may affect the oncologist’s choice of therapies. Molecular genetic analysis of GIST is important because of the availability of drug therapies that specifically target the KIT/PDGFRA receptor kinases. These drugs belong to the class of tyrosine kinase inhibitors (TKI), such as imatinib, sunitinib, and regorafenib. Approximately 85% of GISTs contain oncogenic mutations in either (mutually exclusive) the KIT or PDGFRA tyrosine kinase receptor (Corless & Heinrich, 2008; Miettinen & Lasota, 2006). About 12% to 15% of all GISTs have no detectable KIT or PDGFRA mutations. These are known as wildtype tumors. Less than 5% of GISTs occur in the setting of syndromic diseases, such as neurofibromatosis type 1 (NF1), Carney triad syndrome, and other familial diseases (Corless & Heinrich, 2008). Antonescu, C.R. (2008). Targeted therapy of cancer: new roles for pathologists in identifying GISTs and other sarcomas. Modern Pathology, 21, S31–S36; doi:10.1038/modpathol.2008.9. West, R. B., Corless, C. L., Chen, X., Rubin, B. P., Subramanian, S., Montgomery, K., … van de Rijn, M. (2004). The novel marker, DOG1, is expressed ubiquitously in gastrointestinal stromal tumors irrespective of KITor PDGFRA mutation status. 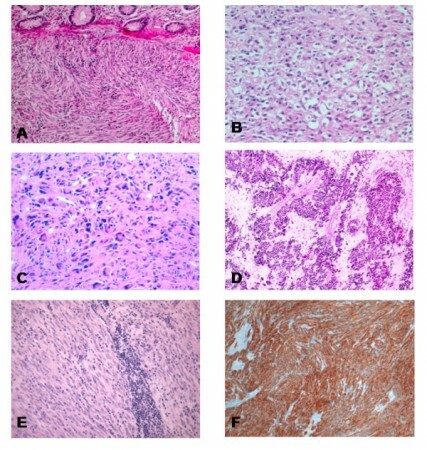 American Journal of Pathology, 165: 107–113.